Artwork from New Super Mario Bros. U. An egg with various green spots. Hatches a Yoshi within a short period of time or by jumping on it. "Yoshi Eggs" redirects here. For information about the team from Mario Super Sluggers, see Yoshi Islanders. For the game for the NES and Game Boy, Yoshi's Egg, see Yoshi (game). Yoshi's Eggs, also known as Yoshi eggs or simply Eggs, are involved in most games featuring Yoshis. Yoshis are known for being capable of laying eggs at will. They usually contain a Baby Yoshi or an item inside. The Yoshi egg is also Yoshi's signature emblem in various games. A rescued Yoshi egg in Super Mario World. When Mario or Luigi finds one of these in Super Mario World, a Yoshi hatches and it acts as a steed, allowing Mario and Luigi to ride it. Yoshi can swallow enemies with the or button. If Mario or Luigi finds another Yoshi egg while an already-present Yoshi is nearby, a 1-Up Mushroom will emerge instead, rather than another Yoshi. According to the story, Bowser trapped all the Yoshis in eggs. Mario also rescues an egg from each Castle he clears, but these eggs do not hatch until the end of the game. The Yoshis that hatch from these eggs are all different colored Yoshis, yet all of the eggs are golden (except in the GBA version). There are also multi-colored Yoshi eggs that appear outside of item boxes in the Star World levels. Approaching one of these will cause it to hatch into a baby Yoshi, its color varies on the color of the egg. In Super Mario World: Super Mario Advance 2, the remake for Super Mario World, the Bros. can find a Yoshi Egg of any color in a ? Block after using that Yoshi in the Star World, though it is dependent on the Bros.' current form (Green for Small Mario, Yellow for Super, Red for Fire, and Blue for Caped). Yoshi eggs also appear in the challenge mode of Super Mario Bros. Deluxe. Unlike Red Coins which are five per each level, one can only find one Yoshi egg. Yoshi eggs may only be found from hidden blocks throughout the level. Collecting one egg earns the player 2,000 points. If the player collects all the eggs from each level, he will earn a reward. After a player has found a Yoshi egg and brought him to the end of the level, it will hatch. To the left: the Challenge Mode progression indicator; a Yoshi egg in a level; if it is collected, it will add an icon next to the Red Coins indicator; the Challenge Mode progression indicator, indicating that the Yoshi egg has been collected. The player can use this feature in the Toy Box. A random stage will appear. The player can stop the Egg Finder's scrolling by pressing . In Super Mario Bros. 2's remake, Super Mario Advance, Yoshi eggs can be collected after the game is completed. This is known as the Yoshi Challenge. Two Yoshi eggs per level can be found in Subspace, in the places where Mushrooms would normally be found. Thus, only three hearts is the maximum capacity during the Yoshi Challenge. The player also must successfully beat all the levels without losing lives. Dying will cause the player to lose the eggs they collected for that level, and they have to collect the eggs again. The Yoshi eggs will hatch once all of them have been found for a world. Yoshi eggs appear in Super Mario Sunshine as well. Shadow Mario possesses one in Delfino Plaza and the player needs to stop him by spraying him with F.L.U.D.D.. Then the player needs to get the correct fruit indicated by a small thought bubble over the egg. When the correct fruit is brought to the egg, a Yoshi will hatch from it. However, if Mario brings the wrong fruit to Yoshi's egg, the egg will turn from side to side, as if trying to say "no". Yoshi eggs appear in many levels, and are sometimes needed to finish a level. When Pinna Park is invaded by a Snooza Koopa colony, the Yoshis residing there flee, insulted by the appearance of creatures who resembled Yoshi eggs. Completing the episode in Pinna Park will cause the Yoshi eggs to appear all over Isle Delfino. Yoshi eggs appear in Super Mario 64 DS as a helpful projectile for Yoshi. They can be acquired by eating enemies and swallowing them to turn into Yoshi eggs. Unlike Super Mario World 2: Yoshi's Island, Yoshi can only carry one egg at a time. If Yoshi wants to eat again, he must throw the egg first. Yoshi eggs will home in on enemies on screen and can bounce off enemies to hit another. If Yoshi swallows a wooden crate, the egg will take the form of a cube. Eggs also appeared in both of Luigi's minigames, the Mario Slot and the Super Mario slot. Among the other slots, a Yoshi egg is in them. Getting three Yoshi eggs in a row will earn the player five coins. Super Mario 64 did not feature any Yoshi eggs, but an unused Egg texture can be found in the game's coding. While the Yoshi Eggs themselves do not appear as actual interactive objects in Super Mario Galaxy, there is a planet in the Good Egg Galaxy that references the Yoshi Egg. Yoshis return in New Super Mario Bros. Wii, hatching from a Yoshi egg when a player hits a ? Block containing one. They behave similarly to the Yoshi eggs in Super Mario World, in which Yoshi also hatches from an egg spawned from a certain block. If Mario already has a Yoshi, the egg will produce a power-up instead. If the player's Yoshi eats five berries, it will lay a Yoshi egg containing a power-up. Yoshi eggs appear in the levels 1-3, 2-5, 3-2, 4-5, 6-4, 7-6. Yoshi eggs also come out briefly during the opening scene of Peach's birthday. It is notable that there is a larger than usual Yoshi egg next to Mario wrapped in a bow. Yoshi eggs appear in Super Mario Galaxy 2, in nest-like holes located in several galaxies, waiting for Mario to break them. If Yoshi is hurt or lost, he will retreat into his egg and must be freed again. Yoshi's egg also resides on Starship Mario. Yoshi eggs reappear in the Wii U game New Super Mario Bros. U. 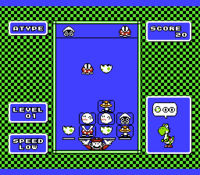 Green, blue, magenta and yellow colored Yoshi eggs appear, which hatch adult Green Yoshis, Bubble Baby Yoshis, Balloon Baby Yoshis and Glowing Baby Yoshis, respectively. The eggs from which the Baby Yoshis hatch appear to have the color palettes and the spots of the eggs switched. Yoshi Eggs reappear in Super Mario Maker and Super Mario Maker for Nintendo 3DS, enabling players to use Yoshi. They can only be used in the Super Mario World and New Super Mario Bros. U styles, as they are replaced by Goomba's Shoes in the others. If an egg (or Yoshi) is crushed, such as from a Thwomp or a falling Bill Blaster, it will disappear. When a Super Mushroom is dragged onto a Yoshi Egg, it'll become a big Yoshi egg which hatches into two Yoshis, which will run like they were hit by an enemy. Yoshi costumes also appear with which the player can pose as a Yoshi Egg by pressing / tilting up. Yoshi Eggs appear in Super Mario Odyssey, where they can be found in secret areas reached from the Dark Side and on top of Princess Peach's Castle in the Mushroom Kingdom. Mario can jump on Yoshi Eggs or throw Cappy at them in order to break them and release Yoshi. In LEVEL2: Yosu Ko, the thing that Wario puts on Mario's head is half of a cracked Yoshi egg. The treasure for the third story of the "Invade Wario Castle" chapter in Wario Land II resembles a Yoshi egg. In the puzzle game Yoshi, top and bottom halves of a Yoshi egg appear on several occasions during gameplay. Stacking the two halves together will hatch a Baby Yoshi, earning 50 points for the player. If a top half of the egg is by itself on the gameplay board, it will dissipate. But if a bottom piece is by itself, it will remain until an upper piece is found, or another falls on top of it. If other objects are stacked on top of the egg piece and a top piece falls on top of the pile, it will plow through the entire stack until it reaches its other half. This results in a different kind of Yoshi hatching from the egg, depending on how many enemies were caught between the two pieces. The kinds of Yoshis which can be hatched is seen below. Additionally, each enemy caught between the egg totals up into an extra 50 points when the egg is hatched. Unlike games that preceded it, Yoshi eggs in Super Mario World 2: Yoshi's Island and its Game Boy Advance remake, Yoshi's Island: Super Mario Advance 3, are used as projectile weapons that are used by aiming and firing. Yoshis can lay eggs by swallowing enemies. 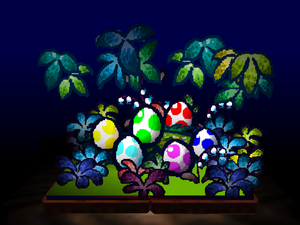 Yoshis can also obtain these eggs by hitting an Egg Block that contains an unlimited supply of Yoshi Eggs and from Egg-Plants that spit out eggs. Yoshis can only carry six eggs at any time. Eggs can also fall into Tulips in this game, resulting in the Tulip spitting out stars. There is the standard green egg, Yellow Eggs, Red Eggs, and Flashing Eggs. Each of the eggs, except the green egg, has a different effect. Yoshi eggs are laid automatically in Yoshi's Story, but are still used as projectile weapons. Unlike in Super Mario World 2, the eggs hold no special effects; although eggs thrown by the White and Black Yoshi have more of an explosive impact. In the tech demo, the Health eggs have light green smiley faces on them. In Yoshi Touch & Go, Yoshi lays eggs when he collects fruit. The eggs can be used to collect items and defeat enemies. Yoshi eggs act the same way in Yoshi's Island DS. Flashing eggs make a cameo in Secret 5 as a tracker for which Easter Egg the player is on but are not usable in the game (in the original Yoshi's Island, they provide a red coin). Large Yoshi eggs appear in the two final battles against Bowser. During the battle, they float in from either side, attached to balloons. During the first battle, only one egg is supplied at a time. Yoshi can pick it up and throw it at Bowser to turn him on his back. If Bowser manages to reach the egg before Yoshi, he'll pick it up and throw it at Yoshi instead. During the second battle, when Bowser grows large, several Yoshis are seen on the screen at one time. Likewise, the balloon supplies several eggs, which can be thrown simultaneously at Bowser to inflict damage. Yoshi Eggs reappear in Yoshi's New Island, where they once again serve as a main weapon, where the act the same as they did in previous Yoshi's Island games. Additionally, there is also a new egg variant called Mega Eggdozers. They can be used to destroy several giant items and enemies. Having been replaced with the Yarn Balls in Yoshi's Woolly World and Poochy & Yoshi's Woolly World, Yoshi Eggs reappear in Yoshi's Crafted World, where they act the same as they did in previous Yoshi games, although they can now be thrown at the items in the back and foregrounds. Throughout the Super Smash Bros. series, three of Yoshi's special moves involve utilizing Yoshi eggs in some way. Yoshi's neutral special move, Egg Lay, lets him swallow opponents and turn them into eggs, temporarily stunning them. His Egg Throw is his up special move, and for his side special move, Egg Roll (introduced in Super Smash Bros. Melee), Yoshi can encase himself in an egg and roll around. Also, his shield makes him encase himself into an egg. A single Yoshi egg appears in one of the events of Super Smash Bros. Melee. In it, Yoshi must keep the Yoshi egg from breaking. If it is broken, the player fails. If time runs out and the Yoshi egg isn't broken, the player wins. In the twelfth event "Sleeping in the Eggs" in Super Smash Bros. Brawl, Yoshi must simultaneously capture Kirby and Pikachu inside Yoshi eggs. In the first three games, the eggs are always green, no matter the palette swap. In Super Smash Bros. for Nintendo 3DS / Wii U, the egg matches the palette swap. Additionally, throughout the Super Smash Bros. series, Yoshi enters stages at the beginning of every match by hatching from a Yoshi egg. An egg is a projectile used by Yoshi in Super Mario Kart. Only the computer may use eggs, and Yoshi has an unlimited supply of them. The egg is a "special" item, but all special items in the game are exclusive to CPU controlled drivers. Only one egg makes an appearance in Mario Kart 64. It is located in Yoshi Valley, near the last stretch before the grassy area and the finish line. The Egg moves about in a circular pattern. When a player runs into it, the Egg will smash the player, similar to when a player gets smashed when they are tiny. Maneuvering around this particular egg is difficult due to its tremendous size. A Yoshi egg in Mario Kart: Double Dash!! In Mario Kart: Double Dash! !, the Yoshi egg is a special item, exclusive to Yoshi and similar to the Birdo Egg. When thrown, the Egg will home on the next place racer. If a player uses it while first, the egg will just follow down the track and break. Unlike the Red Shell, there is a certain amount of distance an egg needs before it cracks, and the red shell is continuous until it either goes off the course, goes into a wall, or hits the player. When it breaks, three random items will get thrown out, which can be Green Shells, Mushrooms, Bananas, Stars, or Bob-ombs. 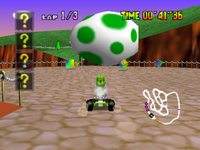 The Yoshi Egg appears as an item in Mario Kart Arcade GP and Mario Kart Arcade GP 2, in which it is known as the Rolling Egg. It is a special item exclusive to Yoshi which can be shot either forwards or backwards. Unlike the Yoshi Egg in Mario Kart: Double Dash! !, the Rolling Egg does not home in on opponents, but rather bounces off walls much like a Green Shell. The Rolling Egg also does not release items upon breaking. In addition to the Rolling Egg, Yoshi has a special item called the Egg Body, which grants him a kart that is based on a Yoshi Egg. This item is exclusive to the first Mario Kart Arcade GP title. Another one of Yoshi's special items, the Mystery Egg, takes the form of a Yoshi Egg with multicolored spots. In Mario Kart DS, the only appearance of an egg is in one of Yoshi's vehicles, called the Egg 1. It is a very simple Kart, consisting of an egg, wheels, and tail pipes sticking up. It has very high acceleration and handling, but low weight and speed, much like the other lightweight vehicles. It was also one of the two vehicles that was most commonly used online, by snakers (the other was the Dry Bomber). In the Yoshi Falls course, the setting is in a road circling around a lake. In the middle of the lake contains a giant Yoshi egg. However, it is just for looks and doesn't serve any purpose whatsoever, unlike the egg in Mario Kart 64. The Yoshi egg appears only as an emblem on Yoshi's Karts and Bikes. There is also a giant Yoshi Egg that appears in the retro course Yoshi Falls, taken from Mario Kart DS. The Yoshi Egg is once again Yoshi's emblem and it also makes small appearances throughout courses. The Egg 1 also comes back from Mario Kart DS. The giant Yoshi Egg from N64 Yoshi Valley in Mario Kart 8. Yoshi Eggs can also be seen throughout N64 Yoshi Valley, as well as the giant one that appears on the track itself. The first DLC pack, released in November 2014, features the Egg Cup, which uses a Yoshi Egg as its emblem. Three Yoshi Eggs also appear in a nest in the logo of the sponsor Yoshi's Egg Market. The Yoshi Egg is once again Yoshi's emblem in Mario Kart 8. When using the different colors of Yoshis, the spots on the egg change color to match the respective Yoshi. Yoshi Eggs appear in Mario Tennis Open during the animations of the colored Yoshis winning the Champions Cup and Final Cup. They eat the trophy and lay an egg that breaks and reveals the trophy. The spots on the eggs have the same color as their respective Yoshis. In Mario Golf: World Tour, a Yoshi Egg is seen in Yoshi's post-hole animations when he scores above par. He turns into an egg when he gets a bogey, but when he gets a double bogey or worse, the egg also rolls around and hits the camera. Giant Yoshi Eggs also appear in Yoshi Lake, with smaller ones being the tee markers. The Yoshi egg emblem as seen in Mario Party 7 and Mario Party 8. In most Mario Party games, the Yoshi egg appeared as one of the objects in various minigames. Yoshi and Birdo's signature orb in Mario Party 7 is the Egg Orb, which transforms any Character Space (excluding Koopa Kid Spaces) into a Yoshi egg. Also, Yoshi eggs appeared in Mario Party: Island Tour as an item in Puzzle Pronto and Three House. Yoshi Eggs also appear in the Yoshi amiibo board in Mario Party 10. 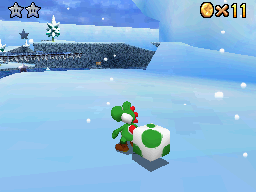 A Yoshi Egg is also seen on a card in the Mario Party: Star Rush minigame Top It Off. A multi-colored Yoshi Egg appears in Paper Mario: The Thousand-Year Door in Glitzville's Hot Dog Stand. Mr. Hoggle wanted to fry that egg to make his Southern Fried Egg Dog of Tastiness for his new menu but the egg bounces away from getting cooked until after a while it jumped on top of the Hot Dog Stand. Using the Airplane Panel on top of the Juice stand and turning into Plane Mode, Mario has to get on top of the Hot Dog Stand and reach the Yoshi Egg. It later hatches, revealing Mini-Yoshi. Yoshi eggs are shown prominently in the minigame Piranha Panic in Mario Superstar Baseball. Players must throw eggs with the corresponding color (red, blue, green, or yellow) to a Piranha Plant to earn coins. Otherwise, the Piranha Plant throws fire toward the player. Purple Piranha Plants shoot fire at all four players, but they are vulnerable to all colors of the eggs. In the Game Boy Advance video game Mario Pinball Land, a Yoshi egg acts as a pinball that Mario could buy at the shop. In addition to the regular green and white Yoshi Egg, there is also a Special Egg that is red with white stars instead of spots, and which combines the effects of multiple items found in the game when used. As well as being given a second ball, like when using a Yoshi Egg, both balls are giant (the effect of the Super Mushroom item), and the drain at the bottom of the screen is blocked (same as when using the Blue Pipe item), meaning Mario can't lose a life. Mario also becomes invincible (as if he used a Star). There are only four Special Eggs available to be found in the game, and upon collecting one, Mario yells, "Special!" Yoshi eggs serve as the objectives of the Dream Equestrian in Mario & Sonic at the London 2012 Olympic Games. In the event, players must race to the finish line, carrying a wagon full of seven colored Yoshis while avoiding obstacles. If an egg falls off the wagon, a 10 second penalty will be added to the player's time upon completing the event. A single red Yoshi Egg is found in Mario & Luigi: Dream Team as an item, and the third item collected during a series of item trades pertaining to a sidequest in Wakeport. Mario and Luigi are given this item from a Red Yoshi in the hotel district in northeast Wakeport after they give him the Rare Fruit. Mario and Luigi must then head to the west side of the entrance to Pi'illoper's house in northwest Wakeport to give this item to a nearby Toad, who will thank them and give them Peach's Photo in exchange. "The world-famous Yoshi egg. The big-polka-dot pattern is SO CUTE." In Mario & Luigi: Paper Jam, the Yoshi in the mission "Yoshi Rush" eats three berries, creating Yoshi Eggs. The Yoshi Eggs trail behind the Yoshi during the race, and can be kicked at the Mario Bros. in order to slow them down. 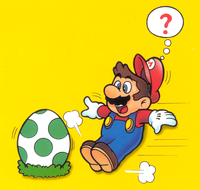 In the Club Nintendo comic "Ostern im Schwammerlland", the Easter bunny dropped a Yoshi egg, out of which Yoshi emerged. A Yoshi egg played an important role in the comic "Mario in Mariozilla", published in the same magazine. In this story, some fog coming out of Kamek's broom shrinks the Magikoopa and Mario to ant-size. When they sit on a blade of grass waiting for help, Yoshi swallows them. All attempts to get the two out of Yoshi's mouth fail, but ultimately Dr. Light gets the idea that Yoshi laying an egg could be the solution to the problem. Yoshi obviously has difficulties doing so, but two hours later, he finally lays an egg. Light breaks it up and indeed Mario and Kamek come out of it. A Yoshi egg can be received in Animal Crossing: City Folk for 1,000 shop points, and in Animal Crossing: New Leaf, a Yoshi egg is one of the 50 prizes from Fortune cookies. In Animal Crossing: Pocket Camp, Yoshi's egg can be claimed as a reward after catching a Cheep Chomp in Fishing Tourney #12, which began on March 14, 2019 as part of the Super Mario crossover event for Mario Day. In the Nintendo 3DS and Wii U eShops, there was a challenge where shoppers had to find many Yoshi eggs scattered around the shop. This went on from April 17, 2014 to April 24, 2014. Artwork of Mario in Yoshi holding a Yoshi Eggshell. A Yoshi Egg (which eventually hatches before Mario, Luigi, and Princess Peach consume it) from the first volume of the Super Mario Kodansha manga. Artwork of a Yoshi Egg on a tilt. In Mario & Luigi: Bowser's Inside Story, Fawful Guys have an attack in which an unknown creature (possibly Yoob) encases them in an egg and throws them at Mario or Luigi. ↑ Brian. (December 16, 2014). Mario Pinball Land (Gameboy Advance): Red Yoshi Egg. Retro Achievements. Retrieved December 4, 2015. This page was last edited on April 20, 2019, at 12:05.